Meanwhile he was active on several Sonic forums with the alias of KnucklesRulz, and, notably, he was active on the more popular CMCT (now gone). CMCT hit really popular status around 2003-2004 and was where he met the2pacfan47(known as MagnemX at the time). Metallix met with notable success at CMCT. He was well respected, well liked, and was even a candidate for administrator at one point. Bored with a forum that had no specific subject, he decided to make a more specialized forum, dedicated to one topic. CMCT, which by then was slowly dieing, inspired him to create another Sonic forum, but he didn't want just another dull, run of the mill Sonic forum like CMCT. He wanted something unique, something fresh, something that would outdo everything he had been a part of. He then left CMCT to focus on his own forums(although he returned occasionally) and started working on a skin that would separate his new forum from the others and the result was Sonic Blast. After the launch, Metallix asked the2pacfan47, his old friend from CMCT, if he wanted to join. the2pacfan47 agreed and the two immediately set about organizing the forum. According to initial reception, it was an unusually good Sonic forum that had a unique look, and had an appropriate number of forums. Despite this, Sonic Blast had no immediate success. The first few weeks only saw 20-30 posts a day, mainly from the original two. Only a few members trickled in, at first. Metallix spent most of his time posting and advertising on Sonic forums all over Invisionfree and the web. The forum remained a trickle until three months after its creation, July 26th, 2006. At that time, Sonic Speed Forum merged with Sonic Blast, increasing its momentum, with the ultimate goal of someday becoming something much more than a mere "small forum." The future was bright for Sonic Blast, as 2006 faded into memory. It was still a relatively small forum, but it continued to slowly grow, averaging 125 posts per day. 2007 continued this trend, with the forum averaging 187 posts per day through September. June 20th marked an outstanding high for the forum, with 636 posts in a day, but it wasn't until October 2007 that the forum's activity truly exploded. Between October and December 2007, Sonic Blast had an average of 649 posts a day with an incredible record high of 1,615 posts on December 1st. While 2008 didn't have as huge an increase from 2007 that 2007 did from 2006, it still garnered over 50,000 more posts than 2007. In 2008, when Sonic Blast upgraded from Invisionfree to Zetaboards, Metallix changed his name to Neo Metallix. In the same spirit of progress and change, Metallix added more interactive forum skins, adding to the forum's unique interface. Today, Sonic Blast hosts thirteen optional, original skins. 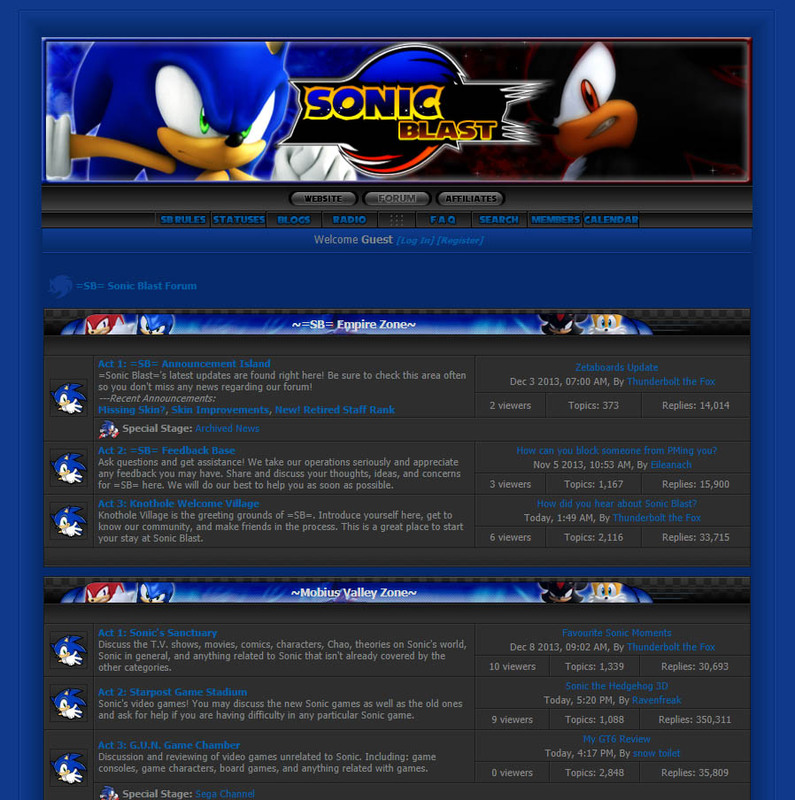 Then, on January 18th of 2009, Sonic Blast reached a new, almost overwhelming height of 300,000 total forum posts. 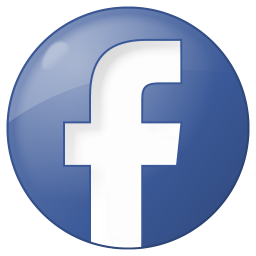 2009 was a huge year of growth with nearly 100,000 more posts than 2008 equaling a grand total of 247,175 posts for the year. After that SB practically ran itself as far as activity goes. SB shot itself up to the stratosphere, becoming the most active Sonic forum on the web. It peaked in in 2011 with 260,705 posts for that year. In 2012 there was a downward trend that was slow followed by a sharp decline by 2013 that bottomed out in 2015. This was largely attributed to the rise of social media and inability to maintain the site due to chaotic conditions that were presented in Metallix's life. Despite that, the forum always retained a dedicated group of members and never completely died. 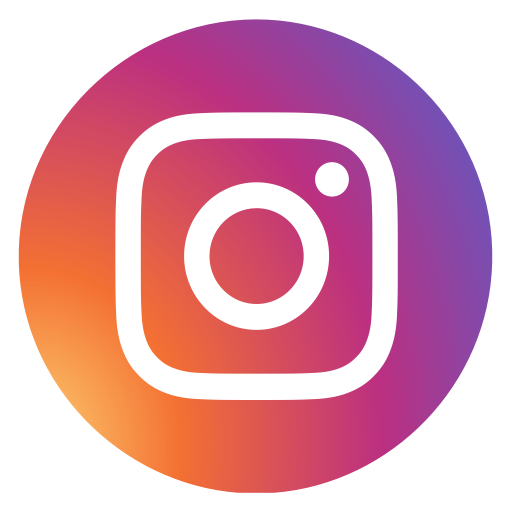 From fall 2016 and onward through 2017 the forum has seen an upward trend to a more active state and the start of many social media pages. Gone were the days of only 50-90 posts per month, it was brought back up to a couple thousand posts per month. This is mainly thanks to a return of Metallix and retooling the forum. 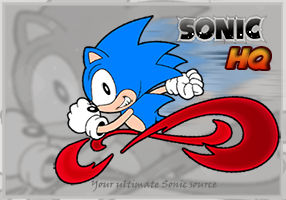 Mid 2017 marked a huge collaboration between Sonic Blast and Sonic HQ, two Sonic fan sites of extreme heritage merging to benefit one another. The forum had always needed a legitimate site but due to time issues Metallix was not able to keep it maintained. This merger solved that problem and provided Sonic HQ with a forum they could be proud of. Metallix is back today working tirelessly to keep improving the site to maintain the utmost quality possible. Sonic Blast has had an ever continuing alteration of its design, and will probably have more in the future. You can never tell what will change six months down the line. The designs of Sonic Blast are made by Metallix. Metallix is always trying to come up with new styles, many times it just hits him when he's not even trying. Come take a look at what this site used to look like. v1.0 April-October 2006 - This was the very first version of Sonic Blast. I started working on this forum in March 2006. I wanted to make a Sonic forum for some time at this point and I looked around at many fan-made Sonic forums to notice one major flaw, the appearance. 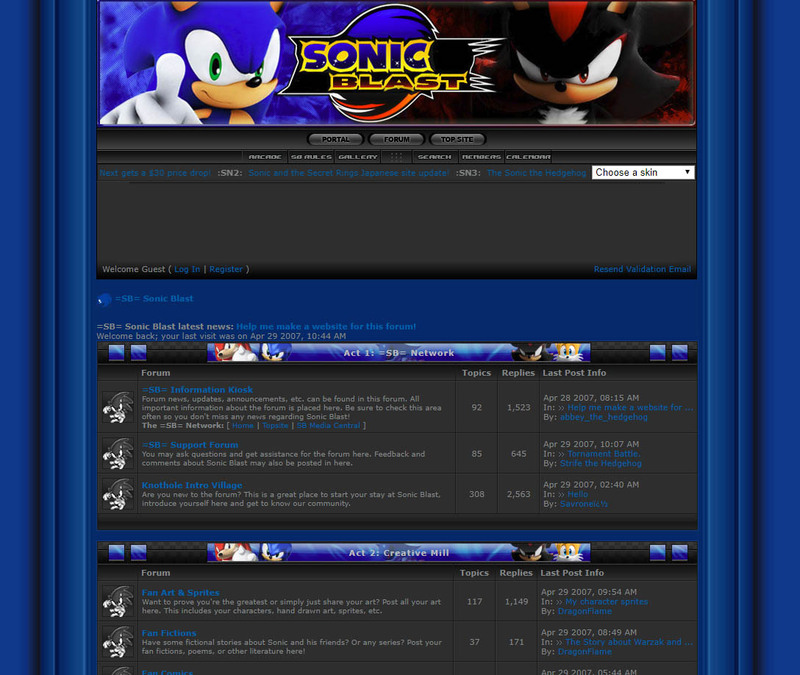 Most Sonic forums were half-assed with either eye searing colors or just plain standard themes. I had dabbled in skins before, but really had no experience with most of my forums using pre-made skins. 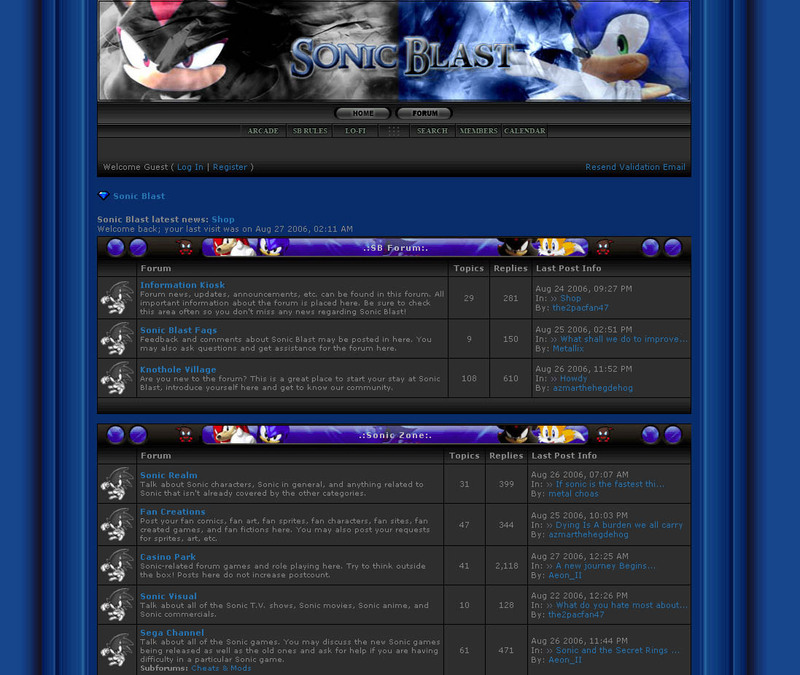 v 2.0 November 2006-November 2007 - This was the second version of Sonic Blast. The first skin was decent, but it took me many months to perfect and even then it kept evolving to become even better looking. This one refines the design even further, looking more sleek and professional. v 3.0 December 2007-June 2017 - This was the third skin we had that was tweaked throughout the years but this image represents what it looked like for most of those years. Small tweaks here and there but the skin largely remained the same.